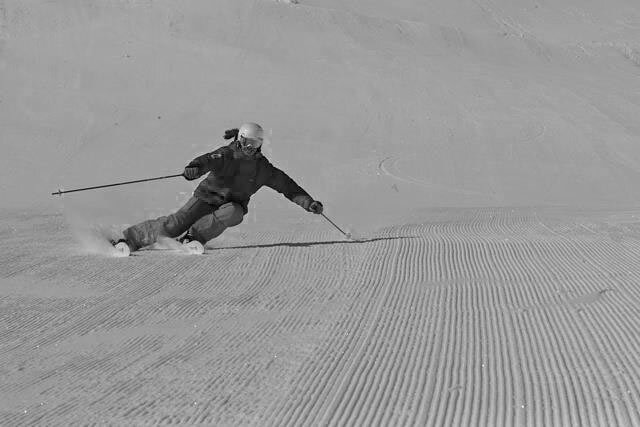 To make good carved turn You of course need to put ski on edge but more importantly, to put pressure on the ski. 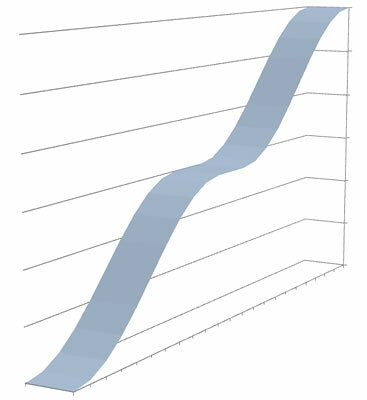 Forces acting to skier arranged so that at second half of turn pressure apply to ski automatically. But in the first half of turn it should be given special attention for put pressure on ski. 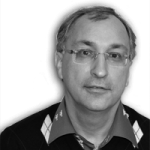 I will try to give only the simple and undeniable moments like “Volga-river flows into the Caspian Sea” without complicated Phys-math analysis. We will talk about the pressure on the ski. 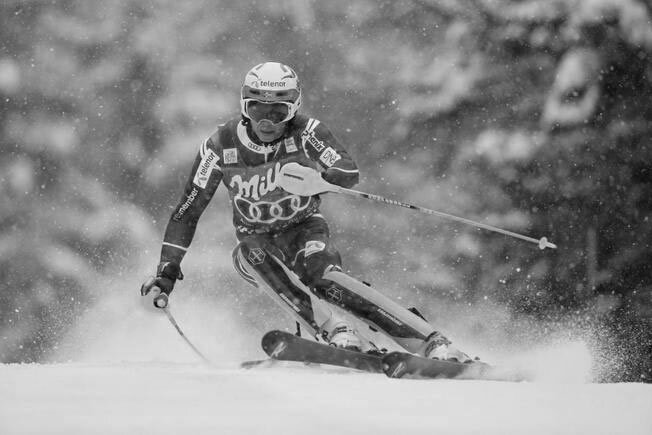 The study of slalom Atomics, “Atomic Redster FIS SL 15/16, become stiffer” showed that for reasonable bend of ski when all edge lead at surface it’s enough to apply no more than 20 kg force. It seems a very little if you stand on a flat surface or ride straight downhill on real slopes. However, not everybody ride with carved turns. Rather, even a small part can do it, even among advanced skiers. A large part uses short traverse across the slope, quick turn and then again short traverse. I will not focus on this, just want to say that it is not easy to make a circular turn on skis, despite the fact that the skis seems should do it automatically. However next, we will still consider the circular turns. It looks especially nice on fresh snow, because traces are clearly visible. 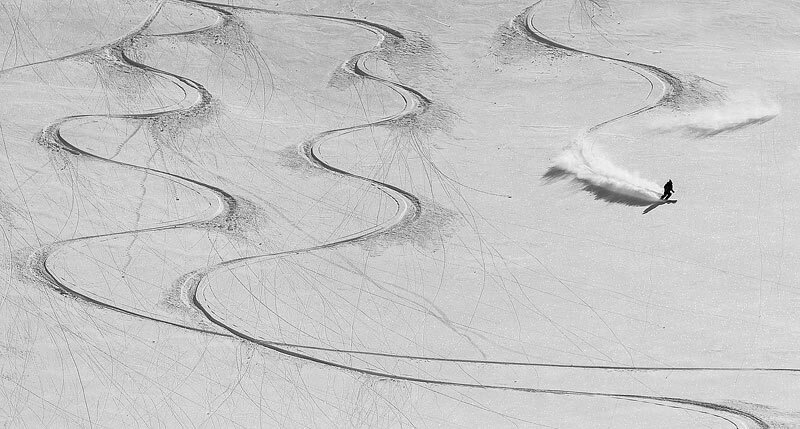 Here is captured the second half of the turn when the skier is pressed to the curve with a few additional forces to his own weight. Let us now consider the first half of the arc at which the skier will be a little bit later from moment of the photo, immediately after the edge change. 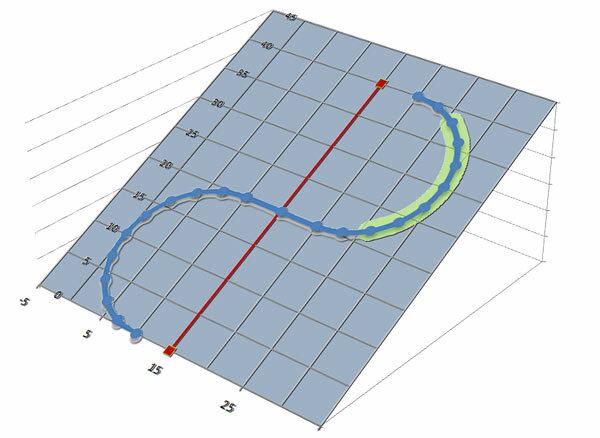 For simplicity, we will not take into account the effect of centrifugal force, parametric resonance (swing), etc. Leaving only the gravity. Let’s see how it will look on the arcs of the two semi-circles with a segment of traverse across slope. 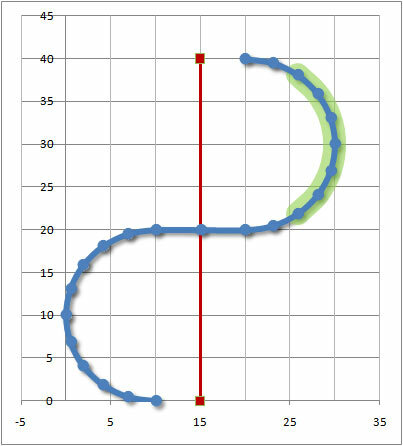 It is interesting to note that the area of descent down (marked in green) can be reduced to a constant slope in a straight line sloping slightly less than the actual downhill line (marked in red). But further relief fundamentally changed, there is appeared a take-off (jump). Here is a this descent into 3D. 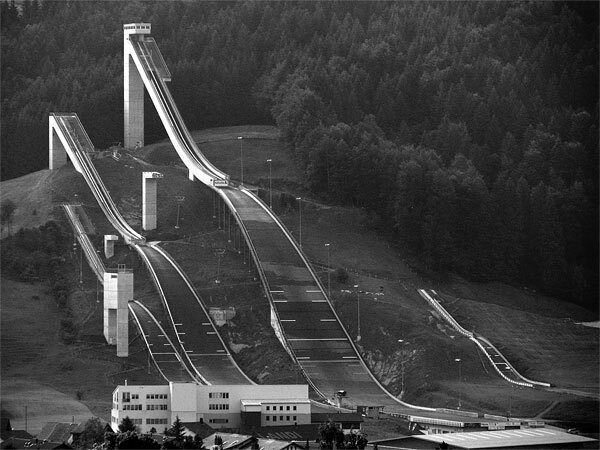 And this picture of real ski jumping hills. It seems to me, it is very similar. Thus, if nothing special is done, then at the moment close to edge change will occur take-off from surface. If pay attention to avoid it, it could still happen, all depends on the speed and the steepness of the turn. For example, Felix Neureuther at such moment. From my point of view at this season Henrik Kristoffersen flies much less then others top-10. Very noticeable (for me) that the he change edges usually very mild and ski pass from edge to edge without take-off or change of direction. But in fact, to apply photos from the World Cup as confirmation of messages is not quite reasonable because of two reasons. Firstly, you can find any position as an extremely correct, and vice versa, because the skiers ride to result “at any cost”. Secondly, they are quite another people, as is usual in professional sports. They are similar to common people only when do usual (daily) moving. Therefore, to look at them with an appeal to “do as I do” is not quite correct. It brought a photo to illustrate the effect of the take off only. 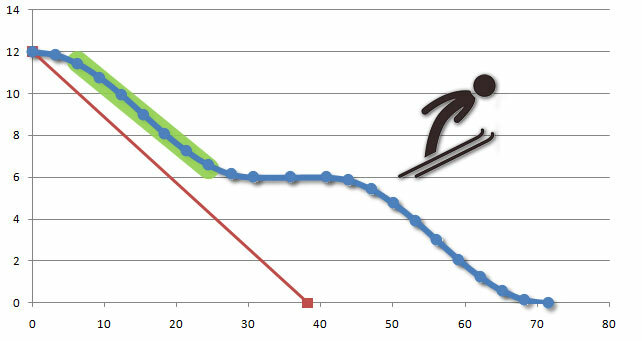 So, the example of conjugated turns of the two arcs lead to effect of ski jumping at the beginning of the second arc. What does this mean in terms of the pressure on ski? The pressure on the ski is zero. That is nor 20 kg, nor 5, but absolutely nothing. Therefore, ski not bend and therefore does not go along an arc. That is, there is no the beginning of the second arc at all. And there is not arc at all while the skier in flight. It is interesting that for skiers with a “classical” background (who rode before the era of carving skis) is nothing unusual in this phase. It could be done a lot of useful things during fly: change of edges, redirection of skis (turn in the air), and just a nice feeling of flight which is very difficult to refuse 🙂 . From side it may even seem like a skier continues to move in an arc. 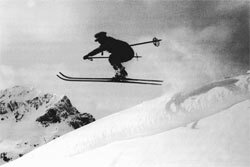 So in general, the effect of jump is present and usual skier is actively using it. Advanced skiers also uses when necessary. From my point of view, skier need to take into account the effect of such take-off and try not to use fly specifically for edge change and redirection. 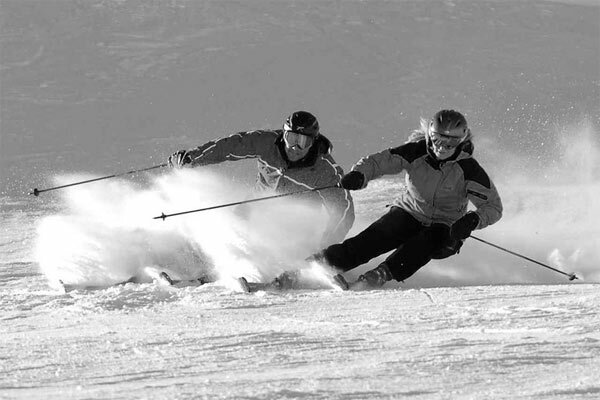 This will allow to put pressure on the ski in the first half of a turn and thus keep control on ski during turn.